Cesar Chavez and Larry Itliong merge their unions to become the United Farm Workers.In solidarity with our sister organization, the Filipino American National Historical Society (FANHS)﻿, please take some time to read their statement on the film Cesar Chavez. Seattle, WA— The National Board of the Filipino American National Historical Society (FANHS) celebrates the appearance of United Farm Workers (UFW) co-founder Larry Itliong in the Hollywood biopic Cesar Chavez. However, FANHS argues that the film misses an opportunity to offer a nuanced and accurate history of the farmworkers movement that was born of the Filipinos’ 1965 Grape Strike because it does not emphasize the importance of the historic multi-ethnic alliance between Mexicans and Filipinos in the UFW. Itliong and ChavezFANHS hopes that moviegoers inspired by the film continue to learn about the movement and are spurred towards dialogue and action towards today’s movements for worker justice and such issues as immigration reform. Andy Imutan, Delores Huerta, Larry Itliong, & Robert KennedyMabalon’s 2013 book, Little Manila is in the Heart: The Making of the Filipino American Community in Stockton, California (Duke University Press), tells the story of the Filipinos’ farm labor struggles from the 1920s onward and the rise of Stockton’s Larry Itliong, a veteran labor organizer in California agriculture and Alaska salmon canneries. In 1960, Itliong was an organizer for the predominantly Filipino union, the AFL-CIO’s Agricultural Workers Organizing Committee (AWOC). When Delano grape growers refused a wage of $1.40/hr, more than 1,500 AWOC members went on strike and walked out of the fields on Sept. 8, 1965. When Mexican scabs took their jobs, Itliong convinced Chavez and the National Farm Workers Association (NFWA) to join the strike. On September 16, 1965, the NFWA voted to join the AWOC. In 1966, the AWOC and the NFWA merged to form the United Farm Workers Organizing Committee. 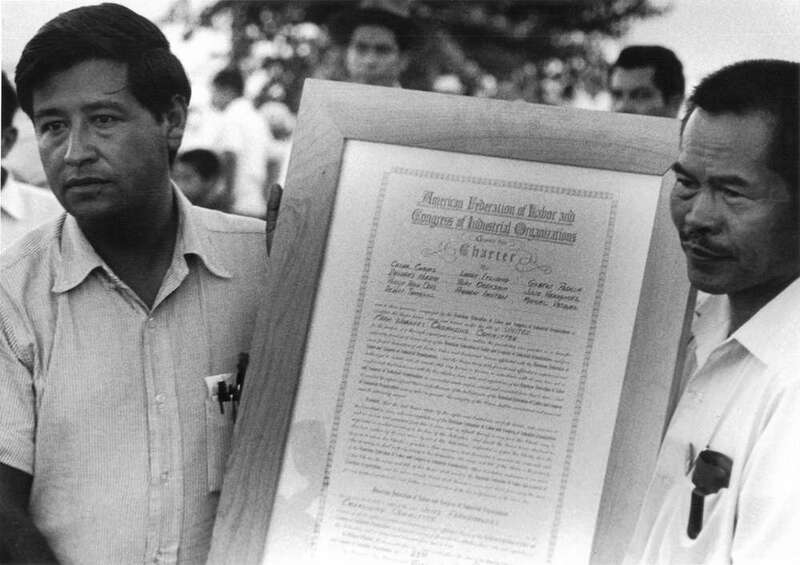 Cesar Chavez was named director, and Itliong served as the UFW’s assistant director from 1966-1971. Philip Vera Cruz and Pete Velasco continued to serve on the UFW executive board. · The film implied that the Chavez organization, the NFWA, was the only union ever in farm labor. Itliong and the Filipinos had been organizing since the 1920s, and they were feared for their militance. Their AFL-CIO’s AWOC had been in Delano since the early 1960s. The Filipino strike that begins on September 8, 1965, is shown for a few seconds on screen and without any context. Delores Huerta & Larry Itliong· The film does not show the historic 1966 merger between the two unions, the AWOC and the NFWA, which birthed the UFW With the new union, Filipinos and Mexicans rejected the “divide and conquer” tactics used by growers (Mexican scabs during Filipino strikes, and vice versa) that had kept the groups from joining to demand better wages, working conditions and basic human dignity. The Grape Strike and the 1966 alliance was unprecedented and changed the course of American labor and social movement history. · The Filipino voice and presence in the UFW is largely absent. Though there were several Filipinos in leadership and several thousand Filipino strikers, only a small group is shown briefly during the Grape Strike. Larry Itliong speaks one line to Chavez. Itliong appears in a few quick shots, always in the background, and is absent through most of the film. · The filmmakers erased Filipinos from key moments in which archival and photographic evidence show the opposite. In the climactic contract scene with major grape growers, Larry Itliong is a spectator in the crowd, though he was actually sitting next to Chavez at the signing and played a key role in the negotiations. When Chavez breaks his fast with Senator Kennedy, the row of Filipino leaders (Itliong, Vera Cruz, Imutan) who were lined up behind him are all missing in the film. When Chavez announces his fast, Itliong is shown briefly, silently frowning in the back, when he actually vocally opposed the move and then facilitated the meeting when Chavez leaves. Itliong and Chavez together led several marches. Itliong is not in any march scenes. · Also missing is Itliong’s long friendship with Dolores Huerta that dates back to the 1950s in Stockton, California, his role as a negotiator, and as a coordinator of the international grape boycott. · The warm camaraderie that developed between Filipino and Mexican workers at Delano’s Filipino Hall, used as the strike headquarters and mess hall for many years (now a national landmark) is absent in the film. The hall is shown twice briefly and without Filipinos, with occasional shot of Larry Itliong in the back. · FANHS hopes that the film inspires a new generation towards deeper knowledge of the farmworkers’ struggle, Filipino American history, Mexican American and Latina/o history and ethnic studies, and inspires more coalition-building, dialogue and action towards the issues of global and domestic worker justice and immigration reform. · FANHS encourages the public to watch Marissa Aroy’s documentary on Filipinos in the farm labor movement, DELANO MANONGS: FORGOTTEN HEROES OF THE UNITED FARM WORKERS, in film festivals in 2014 and on PBS stations next year and to read further about the farm labor movement. · FANHS hopes the popularity of the CESAR CHAVEZ film leads Hollywood to make and support more films that reflect our diverse American stories. Filipino Americans are the largest Asian American group in California, California’s third largest minority group, and the second largest Asian American group in the United States. Latinas/os and Filipinas/os are the two of the fastest growing ethnic groups in the nation. The California State Legislature recently passed AB123, which calls for students to learn about Filipino American farm labor organizing as part of history curriculum. Dolores Huerta testified in support of the bill, which was sponsored by Rob Bonta, the first Filipino American California State Assemblyman. Recently, community members in Union City, California renamed a middle school the Itliong/Vera Cruz Middle School to honor the UFW vice-presidents. With Cesar Chavez Day on March 31st and the film release this weekend, FANHS celebrates the leadership and courage of all of those in the farmworkers struggle, and all those workers and labor organizers who struggle today for justice and fair wages and working conditions. FANHS (www.fanhs-national.org), headquartered in Seattle, Washington, was established in 1982 and consists of 30 chapters nationwide. Members are scholars, educators and community members who preserve, document and share the rich history of Filipinos in the United States.